Easily send automatic email reminders. Developer website: SpiritWorks Software Inc.
Is there a better alternative to Email Scheduler Tracker? 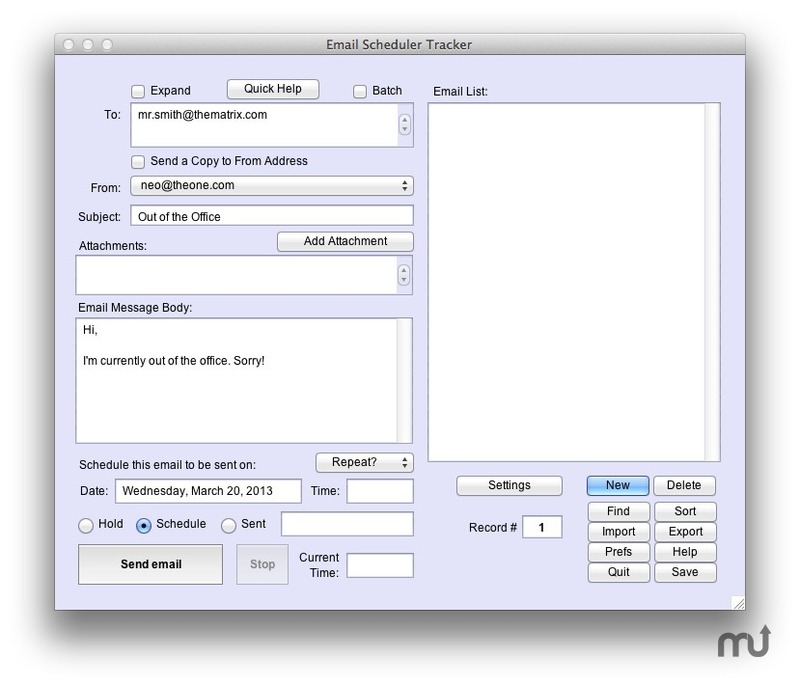 Is Email Scheduler Tracker really the best app in Email category? Will Email Scheduler Tracker work good on macOS 10.13.4? Send automatic emails, to one or more people, in either plain text or HTML text, either immediately or at any time and date in the future, all at once or separately. Schedule an email to be sent Yearly, Monthly, Weekly or Daily. Manage many messages - with or without attachments - to be sent at various times and dates. Email Scheduler Tracker needs a review. Be the first to review this app and get the discussion started! Email Scheduler Tracker needs a rating. Be the first to rate this app and get the discussion started! Emails can be generated (but not sent) while off-line.